Brooklyn Nine-Nine creator Mike Schur isn’t the only one doing the warm sitcom—Modern Family does it; New Girl occasionally does it; I hear The Middle does it—but he might be the best and most consistent. He comes from The Office and he created Parks and Recreation, both of which have decidedly uplifting tendencies and had flaily first seasons before gaining traction later on. With Brooklyn Nine-Nine, he’s gotten it right out of the gate, and then gone further: from jokes to characters to compelling relationships in one season flat. Brooklyn Nine-Nine was that rare TV unicorn, a sitcom that people liked right away, and rightly so: it was funny and self-assured from the start. It got good reviews and reasonable ratings, and it won two Golden Globes (Best Television – Comedy or Musical and a Best Actor – Television Comedy or Musical nod for Andy Samberg) before it had aired a full season—which everybody thought was a little dumb, but may have given the show a little extra time and confidence. The task of any freshman sitcom is to hang on long enough to let its characters find their voices, and Brooklyn Nine-Nine has done that, largely by being funny enough and well-liked enough at an early enough date to sidestep worries about cancellation. (The writers also had the brains to develop the entire ensemble and avoid becoming The Andy Samberg Show—a smart move, since a lot of people find Full Samberg off-putting. Here, he’s allowed to play to his obvious strengths and show off a few less obvious ones.) That said, the growth spurt took awhile. As late as Thanksgiving, it was hard to remember exactly who was who (now which brunette was the kiss-up, and which one was that girl from Twitter?) and why we cared, exactly, aside from all the jokes. But it did eventually come: with time and careful writing, the archetypes of the Nine-Nine have become fictional people, identifiable and with full-sized personalities. Most importantly—and this is maybe Schur’s greatest gift as a showrunner—every single character on this show has an identifiable heart. 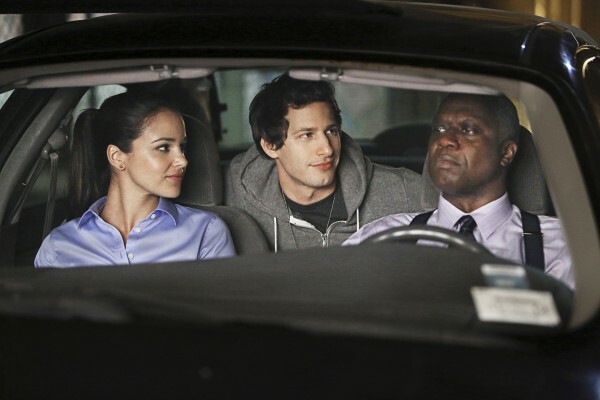 From the deadpan Captain Holt (Andre Braugher) down the line to his weirdo assistant Gina (Chelsea Peretti) to the show’s protagonist, professional goofball/detective Jake Peralta (Samberg), everybody wants things, and fears things, and tries to keep secrets—and when those things collide, as they always do on a sitcom, we get unexpected moments of grace. It’s very, very funny, but it’s generous funny, and it’s those vulnerable spots that make us care. Early on, a lot of people pointed out that the characters on Brooklyn Nine-Nine bear certain resemblances to the characters on Parks and Rec: intense goody-goodies Amy Santiago and Leslie Knope; ultra-stoics Ron Swanson and Captain Holt; golden-hearted angry ladies Rosa Diaz and April Ludgate; perpetual bumblers Gary/Jerry/Larry and Hitchcock & Scully. And it’s true that Schur has his types, and the two series have similar rhythms—but it isn’t a problem. Amy and Leslie may be different sides of the same coin, but they express themselves differently. Rosa isn’t April. And we all know Gary/Jerry/Larry would just think Hitchcock & Scully are the coolest guys ever. And when it comes down to it, is a family resemblance to Parks and Rec really the worst thing? So, all this character-building is great—but for what Schur is doing with the warm sitcom, it isn’t enough. Lots of shows have good characterization; not as many play good characterization into nuanced interactions that stand the test of many seasons. Around the beginning of the year, carefully established relationships began to emerge across the character matrix, from the big names all the way down to recurring small-dose characters like Hitchcock and Scully (see: Gina and the secret bathroom). The expected combinations are there, for sure: loose cannon Peralta and ultra-stoic Captain Holt, Peralta and teacher’s pet Santiago (Melissa Fumero, who’s great on this show), and the like. But a lot of the interesting stuff lies, as it so often does, on the periphery. The series started off with a potentially tough-to-pull-off unrequited-love story between the awkward foodie Boyle (Joe Lo Truglia) and the generally terrifying Rosa Diaz (Stephanie Beatriz). Would they overcome their complete incompatibility and fall in love? Mercifully, no. But Schur and Co. worked with the concept and came up with something compelling but not insane: they would overcome a little of their incompatibility and become friends. In his hour of being dumped by his fiancee, it was Rosa who talks him through with sincerity and grace—and because of the slow creep of their relationship over the course of the season, it didn’t feel strange. This is the kind of groundwork that allows for long story arcs and keeps viewers coming back week after week. One note of potential awkwardness: toward the end of the season, Peralta began nursing a crush on Santiago. This is pleasant: Samberg sells it, and Fumero has a great semi-awareness that she somehow gets across, and the whole thing allows for a certain number of goofy and touching romantic hijinks. It also makes a sort of strategic sense; people love having a couple to root for, and that extra emotional hook might ensure that they don’t forget to tune in come September. It’s enjoyable—but it feels like it was introduced too late and moved forward too early. This is the kind of storyline that does especially well when it’s introduced immediately (a la Jim and Pam on The Office) or worked in slowly during a longer run (Leslie and Ben on Parks and Rec, indicating that Schur knows exactly how to do this), but something about bringing it up a month or six weeks before the season finale feels just a hair forced. In the finale, just before breaking contact and going undercover long-term, Peralta confessed that he’d like something to happen between them. It was a nice scene, but it didn’t need to happen yet. Endless delayed gratification in TV love can make things awkward and ridiculous, but making a move too soon cuts out the thrill of waiting awhile—and we’re still well within the bounds of a little healthy pining. The show wasn’t in danger of cancellation (I’m looking at you, The Mindy Project). It could have waited. Anyway. As the first season ends, we’re left with a fun concept for next year: Peralta goes undercover to root out the mafia. It’s unclear how that will work logistically, assuming he’ll have to cut off all contact with the rest of the Nine-Nine, but that’s a concern for another day—and I think we can assume it’ll be good. They’ve got their act together. This is the second of a three-post series on the Fox Tuesday-night comedy lineup. Hop on over to New Girl here; stay tuned for The Mindy Project!